Dr. Tom Bomberg graduated from Northwestern Health Sciences University in Bloomington, Minnesota. After graduation, Dr. Bomberg became licensed in the states of Illinois and Indiana. Dr. Bomberg started his chiropractic career in a large clinic in downtown Chicago. After six months in this setting, Dr. Bomberg decided to start his own clinic so he could focus on providing his patients with more individual care and attention. Feeling that Minnesota would be a better place to raise a family, Dr. Bomberg moved his practice into his father’s office building in Plymouth. Over time, his practice has grown considerably. Having outgrown the original location, Dr. Bomberg made the decision to move into Bomberg Chiropractic into its current space in New Hope. Bomberg Chiropractic has grown over the last few years, and is now made up of an even larger team of professionals offering a wider range of services. However, the principles that led Dr. Bomberg to open his own small practice have remained the same. 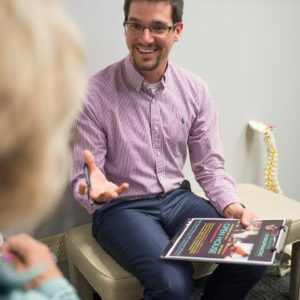 The team at Bomberg Chiropractic uses a hands-on approach and treats each of their patients with specially-tailored services, rather than a one-size-fits-all approach. The health of his clients is always Dr. Bomberg’s primary concern, and our office operates under the mindset that the patient always comes first. Beyond simply addressing issues with the vertebrae, Dr. Bomberg and his team also work on the body’s soft tissues. This method improves the outcome of the adjustment process by preventing tight muscles from pulling the adjustment out of place. Dr. Bomberg is a certified practitioner of the Active Release Technique. This certification is rare, and requires 30 hours of training each year in order to stay certified.